Christmas morning I awoke to the sound of a kitten squeak. 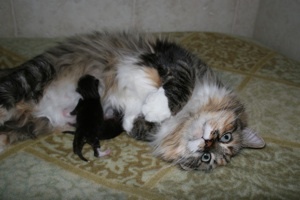 I truly sprang from my bed and ran to my master bath, where every litter is born. TigerLily has been listed as Retired for a while now. She has had several false pregnancies and I felt it was best to retire her. However, I just couldn’t go through with the spay. After 2 1/2 years without babies of her own, she was bred and at last was pregnant, due a few days after Christmas.